"God is good and His timing is perfect!" Pastor Houston shared in a blog post explaining the expansion of his ministry to Hollywood. "Los Angeles is a city of millions of people — people chasing broken dreams, people desperate for hope in a higher cause, people longing for meaningful relationships with one another. Hillsong Church is about all those things. It is about 'welcoming home' the lost, the broken, the hurting, and the lonely. It's about connecting families; building purpose and value into everyONE and it is about seeing the Good News of Jesus Christ proclaimed everywhere — including the bright lights of big cities like LA." Houston expressed his "heart and prayer" that Hillsong LA "will add to the growing skyline a name Higher, Brighter and Greater than any other…JESUS." The Hillsong founder announced on Sunday that his son, Benjamin (Ben) Houston, and daughter-in-law would be "pursuing their dream of starting Hillsong In the Los Angeles/Orange County area" some time next year. Ben Houston, who shares three children with his wife, Lucille, shared in his father's blog post that he first felt a calling to Southern California at the start of the year. "Any time I was in prayer, or writing, or any other God-moments the same thought would keep going through my mind and burning inside of me," he stated. "It got to the point where I spoke up to Lucille about the possibility of us moving to L.A. to plant a church. She is the most amazingly supportive and releasing wife and was shocked at first, but excited to see if God was in this. It didn't make a lot of sense in the natural — as we love Sydney, have an amazing role in the church, and our family is very set up here. But we couldn't shake that God was calling us out of our comfort zone to do something significant for Him." Ben Houston insisted that his plans for Hillsong's expansion to L.A. were not "indiscriminate," but "are intentional, prayed about and thought through." "They are accompanied by many conversations and a heartfelt desire to see the decision and the outworking's of it, done with great care and integrity," he added. 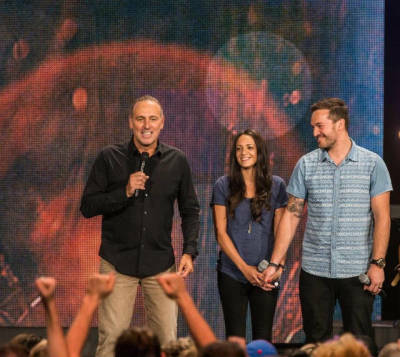 While there were no concrete details made available regarding when the new plant will launch or who might join Ben and Lucille Houston in their venture, the Australian megachurch has launched a website for Hillsong LA and was welcoming those interested in participating. Hillsong, also known for launching the Hillsong United worship band whose iconic songs remain a staple in many Christian churches, has locations in London, Stockholm, South Africa, Barcelona and in other countries around the world. The church has six campuses and a dozen extension services across Australia. Hillsong NYC, the Sydney megachurch's first U.S. plant, has been noticed for its rapid growth since launching in February 2011. The megachurch, led by Pastors Carl Lentz and Joel Houston and popular with New York's 20-30-somethings, draws about 5,500 people to Sunday services. The church is known to attract celebrities and high-profile figures like the NBA's Kevin Durant, who was baptized at Hillsong NYC, and recording artist Justin Bieber. Hillsong Church was started by Brian and Bobbie Houston in 1983 as Sunday night outreach meetings that initially attracted a few dozen people. Now, the Sydney megachurch, affiliated with Australian Christian Churches (the Assemblies of God in Australia) is the country's largest and hosts over 30,000 worshippers every weekend. An article published Tuesday, Sept. 10, 2013, stated that Hillsong NYC draws more than 21,000 people every week to services. The New York City megachurch draws about 5,500 visitors for Sunday services. Joel Osteen at Hillsong Conference: God Used 'Dead' Lazarus, Why Can't He Use You? Justin Bieber 'Breaks Down' During Pastor Carl Lentz's Hillsong NYC Sermon?